Sooner or later we all have to call a plumber. A plumbing technician is costly and there’s no chance around that. There are a variety of methods to get the best plumbing services for your cash. Here are some tips to help you hire the right Plumber. The first, and usually only thing, that consumers zero in on when comparing plumbers is their hourly rate. People figure that they must work with the respectable firm with the lowest price. Consider that when you hire a plumbing company hourly, they could take more time than needed to make a few extra dollars. Do keep in mind that traveling time is a factor that ought to be considered too. The best means to choose a plumbing technician is to read reviews and ensure that they provide client satisfaction regularly. You should into account every one of these reviews, but also assume its natural to have a few bad customer reviews. In the plumbing field, in particular, numerous highly advertised companies have the most awful track records. This is why it’s essential to obtain particular references from others or to undergo a pre-screened plumbing service. Here are some tips and instructions to help you hire the right plumbing company. Call a property owner you know whose viewpoint you trust. Most property owners at one time or another have had to work with a plumber and also could likely turn you on to one on one with a great reputation. Try calling a building contractor or service provider if you happen to know one. Contractors work with many plumbing companies often and usually have well-formed point of views about many local plumbing professionals, the top quality of their work, as well as the competitiveness of their rates. When you acquired your house, you likely used a real estate agent. Talk to the real estate agent who represented you. Realty specialists commonly advise clients on plumbers and subcontractors. Because the majority of brokers wish to keep you as a repeat consumer, they will likely love to help you. When you call a plumbing company, request the plumbing professional’s certificate. This will let you know if their licensed and set you mind at ease on their skill set. The best time to pick a plumbing contractor is prior to you experiencing a plumbing system emergency. However, lots of people encountering an emergency situation have little time to research a plumbing technician. When the commode pours water into the basement or a leak ceiling is wet from a busted pipeline upstairs, finding help is essential. 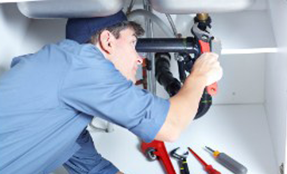 Consider the plumbing contractor’s service guarantee before employing them. If they can’t guarantee the work, it should send up a red flag. Keep in mind that you’re the customer. Make sure your happy with everything before agreeing to anything. Request a cost prior to start of the plumbing project Most trustworthy plumbers will certainly give you a quote, or a minimum estimate with a ceiling rate. Do keep in mind that if issue is within a closed wall or ceiling, they might not be able to provide an accurate quote until actually analyzing the issue.. In this circumstance, request a “worst-case circumstance” price.